I was busy this last few days working with the export functionality of Wikipedia (some new Greyscale publications upcoming shortly…). A quick overview: in the end of 2007, the Wikimedia Foundation announces its collaboration with a German start-up, PediaPress, aiming at developing an export function that would allow “high quality print and word processor copies” to be exported from Wikipedia. This has been progressively implemented on the Wikibooks website, the german Wikipedia, and finally during 2009 it was activated on the english WP site. What is most exciting is that in addition to PDF, the software allows export in the OpenDocument format, which allows further editing and reformating workflows. The software that allows this is available as an extension for Mediawiki — which means that the export function works not only for Wikipedia, but also for indepentent project wikis! At the present moment there are still some quirks (see a list of bugs i submitted), but it’s extremely promising. One perfect example is the Cologne-based publisher Navarra Verlagsgesellschaft, which is producing audiobook CDs based on Wikipedia articles – mostly biographies, such as Albert Einstein, the Dalai Rama, Rembrandt, but also mixed topics, such as Vampires, Pirates, The Titanic… The CSs are listed on Amazon.de, which gives us the chance to listen to sound snippets and appreciate the sleep-inducing monotony of the voice actors. Of course, such a product needs the adequate promotion, and of course, we find an Amazon user account that is giving out 5-star reviews, all of them for products of the Navarra back-catalogue – if you read german, have a look, as the phrasing of the reviews is hilarious. But still, those CDs remain “hand-crafted” products, as human speakers were necessary to make the recordings – a tedious and time-consuming process, which explains that no more than 10 items were produced at this moment. If this business model doesn’t seem viable, have a look at Alphascript Publishing, a Mauritius-based company that is taking the game to a whole new level. Their website claims an anual output of “10,000 new titles” and describes Alphascript as “one of the leading publishing houses of academic research”. 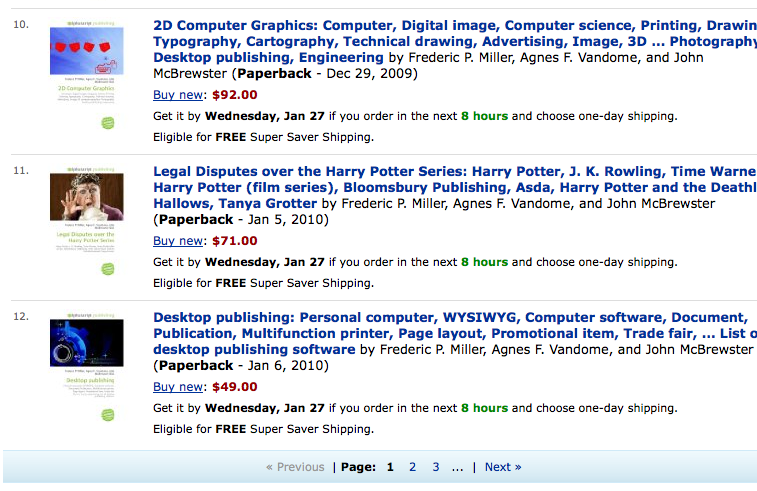 Those numbers are not a joke, since an Amazon book search as of today gives no less than 17,273 results. As we can see, those books, selling for high prices in the 50-120$ range, contain seemingly random collections of Wikipedia articles, bearing a random photography on the cover and the names of three “editors”. One might wonder if a human agent has participated in the selection of the covers, or if it was a fully automated software algorythm parsing a stock-photo database. 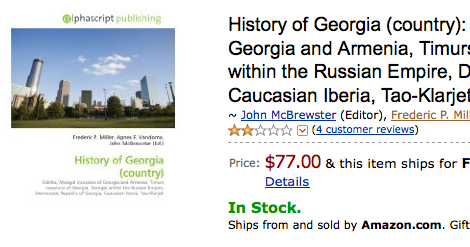 that shows on the cover … a photo of Atlanta, in the American state Georgia. Now, when a book has the wrong image for the cover, you know this is a big indication that something is wrong. It appears that no thought has gone in this book. All articles are copied off Wikipedia and not cleaned up/edited at all (plus, sometimes people vandalize Wikipedia entries in subtle ways so only someone looking closely/is knowledgeable of the subject would find mistakes) As such, this is not a good source for research and/or information. At this date, there are over 17,000 of these “books” published by the same three clowns (or ‘editors’). 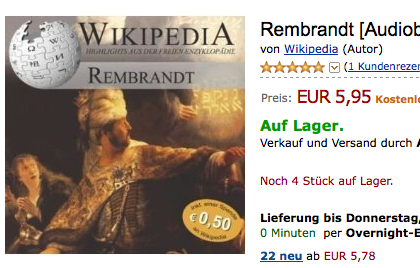 Actually, 4 if you count VDM Verlag. Go to Wikipedia to get the same exact material in this book for FREE, plus you can see pictures of whatever Georgia you want – the state or the country. Too bad the person who selected the picture didn’t know the difference. Har har. Surprisingly, some (very) human intervention is still occuring, as an Amazon user named “VDM Verlag Dr.Müller” has given out 5-star ratings to the Alphapress books. However, there are only 77 of them, merely a drop in the ocean. 1) the pricing, that ranges from 40 to 120 USD per item. 2) the actual Wikipedia authors are not properly credited, the books being listed under the authorship of “John McBrewster, Frederic P. Miller, and Agnes F. Vandome” – names that reportedly do not appear in the edit history of the respective articles. Of course this is one of the issues when producing print copies of Wikipedia articles: how to include the hundreds of authors an article may have, other than in small print at the end? But putting some arbitrary names on the cover is certainly the wrong solution. 3) the absence of any editorial review, which we can deduce from the wrongly used cover pictures, if not from the sheer number of books involved. 1) the pricing, that ranges from 40 to 120 USD per item..
How in Heaven’s name can the PRICE be indicative of some scam? “Absence of Editorial review” is another unfounded and frankly, stupid statement (since Wikipedia itself, has little “editorial review” as well!. The only real issue is attribution, and again, attribution may not be required if the article in question was public domain (though I doubt it). This article highlights one of the problems people have with open source, GPL and free software (or more specifically, their misunderstanding off it). The very act of creating something free and setting it free, makes it free to be used for “evil” as well as for “good”. If you dont like it, release it under a restricted proprietary license and ensure that people sign a non-disclosure/non compete before using! Bill, thanks for making the effort to comment. I will try to explain why I disagree with your points. – In the world of print publishing, the price of a book is dependent on material factors, such as the quality of print materials, the fees paid to authors, editors, translators, and in some cases the “rarity” of the book (limited editions, antique manuscripts…). In the present case, we have simple paperback books of about 80 pages, the fees to authors are nil, and the “rarity” argument doesn’t apply for evident reasons (unless they would be signed by Andy Warhol’s clone). So the pricing, being totally detached from market value, denotes a peculiar strategy on the part of the publisher: he counts on the few cases where an utterly naive customer will purchase the book “by accident” — quite similar to the tactics of email scams targetting a small percentage out of millions. You are correctly asserting that the pricing itself doesn’t make a scam — it’s rather the strategy of making the customer believe that he’s purchasing an in-depth academic study. It’s certainly no coincidence that the “authors” names are mimicking the conventions of academic publishing. 2) “editorial review”. I disagree, there’s actually *a lot* of editorial review happening on the english wikipedia! but when converting a website into a printed book, formatting errors are likely to happen — this process needs editorial review on it’s own, which Alphascript doesn’t appear to provide, according to customer reviews. 3) “attribution”. Wikipedia articles are not in Public Domain — they are subject to copyright, under a Creative Commons-Attribution-ShareAlike License that grants commercial use, but requires attribution. There’s no doubt about it. Finally, despite my criticism of this peculiar economic model, I totally support the cause of copyleft, as the potential for abuse (of which Alphascript stands as a fine example) is largely outweighted by the benefits. So take my post with a grain of salt, I blogged about this because I find the topic fascinating! Interesting development: AlphaScript Publishing has transformed into BETAscript publishing. Same parent company (VDM), different set of “editors”. Same types of books with mention their material comes from Wikipedia. I made the mistake of buying one of their books once. At the time, there were no mention anywhere in the book description that it was taken from Wikipedia articles and I thought this was a venture linked to a University press. It was an easy mistake to make at the time. Luckily, I was able to return the book and get a refund. The books are poorly edited when it comes to leaving only the relevent material inside. Arrows appear in the text, indicating when a word used to be a hyperlink making for extremely clunky reading. Another example of poor editing: their Ancient Egypt book didn’t have the proper hieroglyph fonts, so all text that were supposed to show hieroglyphs were absent, being replaced by a string of letters and numbers (possible Gardiner code, I didn’t check if they matched). That’s only a few of the example from one of their books. What does it say about all their other 10 000+ titles? Doesn’t bode well. If anything, it is a scam to ask that much money for such poor workmanship. If one wants a proper book on a given subject, best to stay away from Betascript. Just look at Wikipedia for free if you’re inclined to use it as reference. Recently I ordered two titles from alphascript publishing: IUPAC Nomenclature and IUPAC Nomenclature of Organic Chemistry by the same authors, F. P. Miller, A. F. Vandome and J. McBrewster. They billed me Euro 39,– respectively Euro 45,–. Both books are without any serious scientific value for people working in this field. Part of the content is lots of rubbish not dealing with nomenclature at all. Letter sizes are as small as one millimeter! some chemical formulas are minimized to unidentifiable. Everything printed in these books is open source, most of the authors cited are using pseudonyms. I consider this fraud and criminal economic behavior. VDM Verlag Dr. Mueller is a German company located in Saarbruecken but registered on the island of Mauritius. There is nothing more to say. This most definitely a scam! Selling something which VDM obviously gets for free without offering any added value is no service to the customer. If the book descriptions on Amazon or other purchasing sites hide the fact the entire content comes from wikipedia is plain and simple fraud and the perpetrators shoudl be prosecuted for this. I personallly started reading up on VDM after I received their spam email about my PhD thesis. It’s on one hand suprising someone is gutsy enough to pull this scam off, on the other hand it’s almost surprising noone has done it before. Copying of wikipedia creeps up everywhere, from students papers to professional expertises. You’d believe together with the multi gazillion cash of investment that wikipedia could acquire some much more servers..
Couldn’t notion that something as exciting as this was noiseless in the oblivion. Your interest of master-work is just astounding. Chuck Norris doesn’t need to understand the work of James Joyce; James Joyce needs to understand the work of Chuck Norris. What’s incredible is that people are ordering these books! I’d love to look into the process by which THAT comes about.